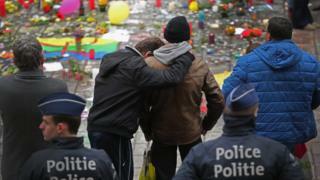 In an editorial I wrote on Monday, after a week of intense anti-terror activity in Brussels, I used an Uzbek proverb - "One man builds a bridge, a thousand men cross it" - to advocate an active, two-way engagement between Muslim communities in Brussels and the Belgian state. Whatever bridges have been or are being built, Brussels' day of terror threatens to blow them all away. And that, to be sure, is exactly what the attackers in Zaventem airport and the Brussels subway meant to do. As the police sirens wailed around my office all morning, I was overwhelmed, rendered speechless. That was not the case for everyone. Was it just the temptation to vent anger, or a pent-up polarisation, that filled Twitter and Facebook with such noxious opinion? Sweeping generalisations, calls for exclusion, purging, a police state. Like whiplash after a collision, first you hit the steering wheel, then you get thrown back - twice broken. I have no way to know what is inside the heads - let alone the hearts - of the bombers, though the signposts seem clear enough. They don't wage war, but they sow terror, fear, mistrust. "Will I take the metro to get to the station?" "What's that large suitcase doing there?" "Does that man look suspicious?" Division. Rage, and rage combined with fear and suspicion, makes hatred. Terrorists know exactly how to fix a deadly cocktail, but are the rest of us compelled to drink it? Those who are now calling for an iron-fisted response to knock "the Other" senseless, are screaming out their impotence: their inability to comprehend this inhuman violence, but also their incomprehension of why this violence can exist. We all share that inability and incomprehension today. The hate that comes with it, for some, at its worst creates for the low-minded a chance for political opportunism. What we need are bridges and oneness. We should embrace everybody who rejects political violence. We need everyone. Today the urgencies precede the nuances: we must care for the wounded, avert the imminent threat, bury the dead, clear the rubble. But the next task is to avoid having the wedge that the terrorist exploded into our society be driven deeper and steadier by angry citizens. We urgently need an effective answer to violent radicalisation. Some people have been working on finding that answer, but we need it faster - as soon as we discard our torn garb, admit and acknowledge our grief, focus our anger and face the damage. The work that lies in front of us is wide-ranging, but it should involve us all. It is easier to formulate the mission than to execute it, but we know that we cannot move forward without starting, immediately, by building a consensus around that mission, in order to make the reaction to these attacks inclusive instead of divisive. The first priority of our governments - and we have lots of them in little Belgium - is to guarantee an effective security for all citizens, with all the resources that takes. Those same governments should also as a priority invest in the society they have to protect: in trust, in the opportunity to have a future, in spaces of encounter, in democratic debate, in the belief that every call to defend "our values" does literally concern every citizen. Our leaders must stand tall and adopt the manner of then Norwegian Prime Minister Jens Stoltenberg following Anders Breivik's attacks in 2012: "We are still shocked by what has happened, but we will never give up our values. Our response is more democracy, more openness, and more humanity. We will answer hatred with love." Terror aims first at citizens, but they need not be solely its first victims; they can become the first responders. The unity we need embraces disagreement, because the society we need and want to defend is democratic, pluralistic and diverse. We might understand today that ugly prejudices seep through the fissures that the attacks created in the social fabric, but tomorrow people of all persuasions and inspirations should join hands to mend both the fissures and the prejudices. We urgently need new scaffolding to repair the bombed bridges and to reconstruct a (better) way of living together. Words that are drenched in vitriol today are multiplied by social networks - those which always function, even when roads are blocked, trains stand still and mobile networks fail. They must be washed clean so they can be re-used for better purposes. E pluribus unum, reads the United States seal: "one from many", unity from diversity. That is what Belgium, and the whole world, needs. Belgium's motto is "Unity makes strength". Let us build that strength and use it to make this world both safe and just, for everyone. Because alone, one-legged, we will not be able to span the gap created by the terrorists in Brussels. Gie Goris is editor-in-chief of MO* magazine, a Belgian print and online publication with a focus on global trends. He has been writing on culture, religion and conflict for more than 25 years, with special interest in Afghanistan and the broader region.